Where is the sun hiding in December in Europe? I opened Google Maps. South of Italy? Greece? Southern Spain? My eyes stopped on 4 small Spanish islands next to Morocco! There, I’m sure the sun is hiding there! 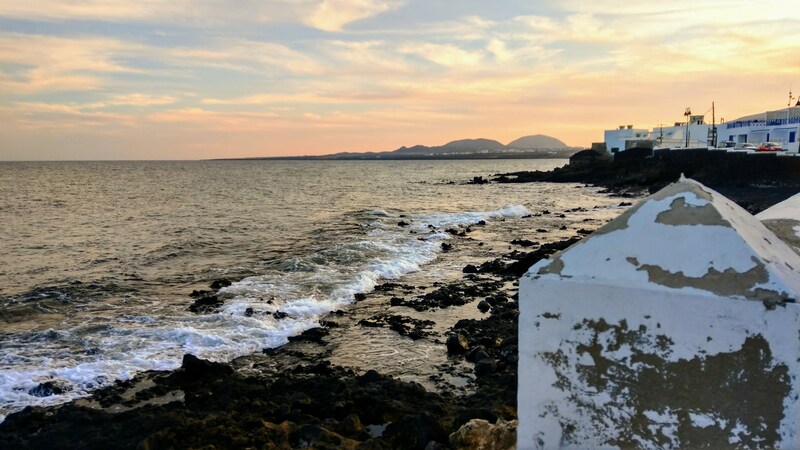 After browsing through a few blog posts and airlines websites, I decided to go to Lanzarote for 4 days: the landscapes just looked spectacular! I prepared a nice itinerary to visit Lanzarote without a car as I haven’t got my driving license for long enough. 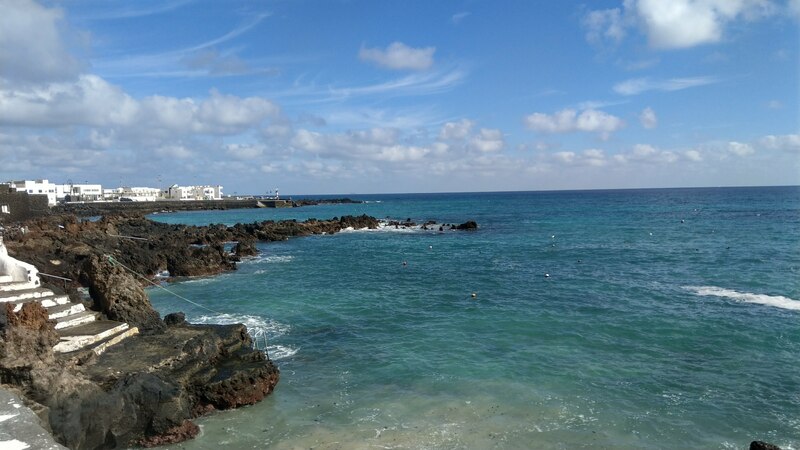 I landed in Arrecife on Saturday afternoon. As expected, the sun was there patiently waiting for me! I took a bus right in front of the airport to the Arrecife bus station-Estación De Guaguas (Line22 – 1€40, every 25mins on weekdays). I waited for another bus to take me to Arrieta (Line7/9). Just arrived in time for sunset! I was originally thinking about staying in Punta Mujeres but there weren’t many places available off-season. So I booked with Apartment Ocean View. I was a bit disappointed not to have a seaview as featured in the pictures but the flat was big, comfortable and I paid a decent price (around 75€). I ate at the Casa de la playa right on the beach. The service was very nice despite my terrible Spanish skills: they even made a cocktail just for me! I walked along the coast to Punta Mujeres, reknown for its natural pools, where I had a nice fishy lunch at Sol y Luna. My next stop was Cuevas de Los Verdes. No bus at that time on a Sunday so I had the walk along the road. Not the best solution but better than nothing! 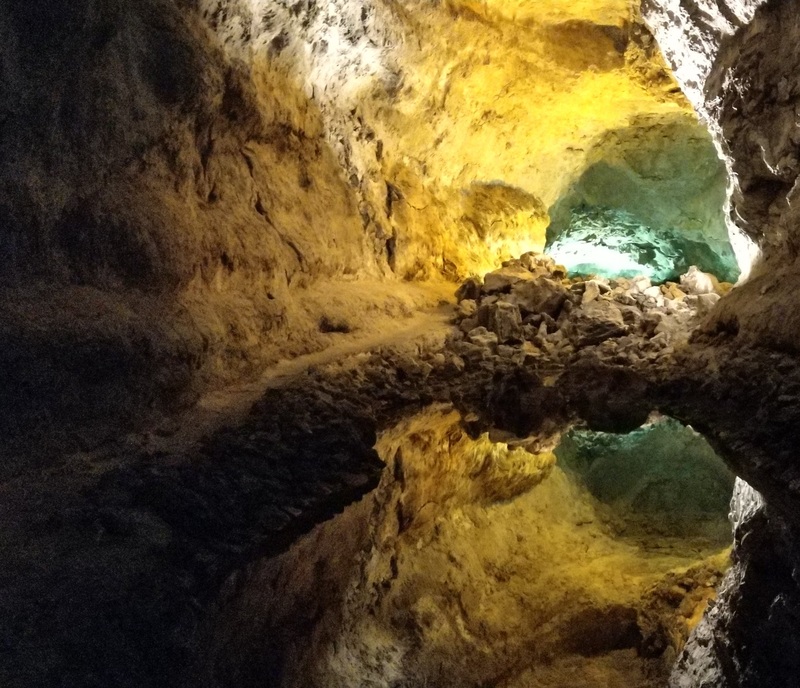 The Cuevas is a lava tube created around 3,000 years ago. There are not very big but well worth a visit! Fun fact: there’s a concert hall! The taxi took me to Orzola where I had booked a cute little room at Casa Salinas Playa for only 20€. Really, absolutely, recommending it! Despite a cloudy morning, I took a ferry to the tiny volcanic island of La Graciosa. There are only about 700 inhabitants who live.. in the sand. No roads! I rented a bike to Playa de Las Conchas, a beach ranked many times among the nicest ones in Europe. The road is not easy. Sand, sand and sand! But it’s really rewarding to reach the beach… Especially that they were only about 5 people on the beach with me! I also climbed the nearby volcano/mountain. Not that easy with th strong winds but the view… just wow! Tip: plan something to eat/drink! There’s nothing at all on this side of the island. After this perfect day, time to take the bus back to Arrecife. After researching among the available trips at home, and being refused a perfect one I had spotted, I booked a tour of the island via Viatour with Low Cost Tours and Amanda Bus. I knew that it wouldn’t be awesome but I didn’t have much choice without being able to rent a car. The buffet was cheap but really not good. You’d be better of preparing your own sandwiches. 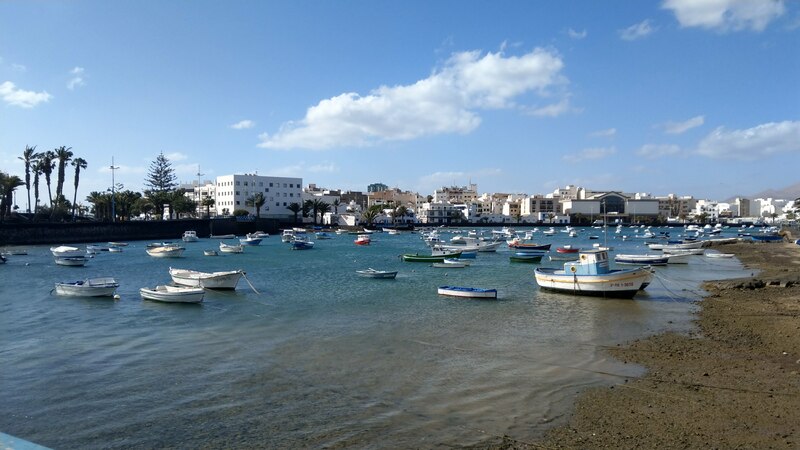 It’s true that Arrecife is not a big city with major attractions but I can promise you a bit of sunbathing on Playa Reducto, a nice windy walk to Castillo de San José and some good shopping at Playa Honda nearby. I actually had to study so I decided to settle down on a nice terrace in the Charco de San Ginés but another idea I had was to cycle down to Playa Honda. During both nights, I stayed in a very nice Airbnb I definitely recommend: big room, nice private bathroom, sunny terrace and Daniela is a lovely host that can take you on private tours (French, Italian, English, Spanish). To eat, I recommend a burger from Tabla Teguise. What will I do next time I come? Any other place you would recommend? Looks beautiful! All I see outside my window right now is snow. Thanks for the brief getaway.